Turkish and rebel forces advanced in the Kurdish canton of Afrin in northwest Syria on Monday, as Ankara vowed to crush the Kurdish militia YPG. On the fourth day of the offensive, Turkey continued to shell the hilly area while Turkish and Free Syrian Army fighters captured the high position of Mount Bursaya (see map), taking YPG fortifications and artillery. Pro-opposition activists said YPG used the hilltop to shell both the opposition-held town of Azaz and the Turkish town of Kilis. 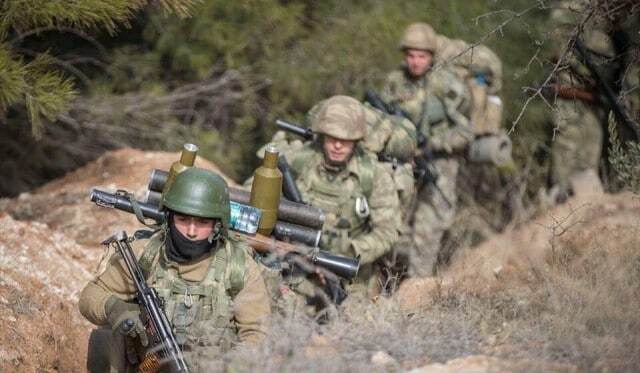 The Turkish military reported its first casualty in the offensive, the death of a soldier amid clashes southeast of the Turkish village of Gülbaba, just across the Syrian border. “There’s no stepping back from Afrin,” Turkish President Recep Tayyip Erdoğan said in a speech in Ankara. The US-supported, Kurdish-led Syrian Democratic Forces hit back in a statement that Afrin would be a “quagmire from which the Turkish army will only exit after suffering great losses”. At the request of France, senior UN officials briefed the Security Council behind closed doors on both the Afrin situation, and on the pro-Assad assaults on opposition-held Idlib Province in northwest Syria and the Damascus suburbs. On Thursday, the day before launching the offensive, the Turkish military and intelligence chiefs were in Moscow for consultations with Russian colleagues. Secretary of State Rex Tillerson said the US has proposed working with Turkey and forces on the ground in Afrin to “see how we can stabilize this situation and meet Turkey’s legitimate concerns for their security”. However, Ankara has pushed the US aside. Erdoğan and other Turkish officials have indicated that the timing of the offensive was a response to reports of Washington’s plans to create a 30,000-strong border force, half of which to be drawn from the YPG-led SDF. When the job is done. We are not eager to stay. We know when to pull out. And we do not care to have permission from anyone to do this. A US delegation is in Ankara on Tuesday for talks. The delegation is led by the Deputy Assistant Secretary for European and Eurasian Affairs, Jonathan Cohen, and includes officials from the Department of Defense. It is part of a joint working group that meets periodically, but Turkish officials said discussions will include the Afrin offensive and the “struggle against terrorism”. A Kurdish group has split from others in the Syrian opposition over the response to the Turkish-rebel offensive. The Syrian National Coalition, based in Istanbul, said on Sunday that the military operations are a campaign to “liberate” Afrin from Kurdish militia and “purge Syria of terrorism”. The Kurdish National Council released a counter-statement on Monday condemning the offensive and saying it had not been consulted before the SNC announcement. “We call for a halt to the bombardment and military operations,” the KNC said as it called on the SNC to criticize the Turkish-rebel attacks so as not to bring “more suffering and danger” to the Kurds of Afrin. The KNC is an opponent of the Syrian Kurdistan Democratic Union Party and its YPG militia, challenging what it says are authoritarian policies. The PYD closed down the KNC’s headquarters and offices in Syrian Kurdistan last spring for being an unlicensed political party. “Politically, we differ from the PYD,” KNC member Yashar Haj Ali said on Monday. However, those differences do “not mean that [the KNC] will stand behind these violent attacks on civilians”, he explained. 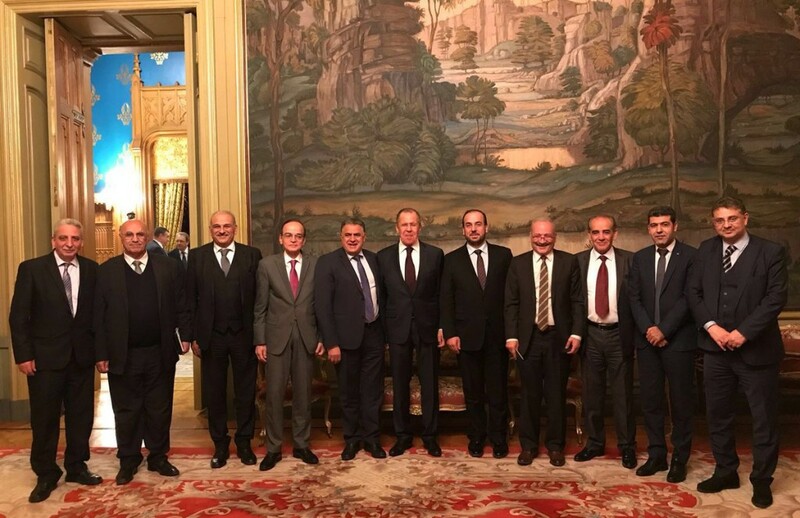 Trying to save Russia’s repeatedly-delayed initiative for a “national congress”, Foreign Minister Sergey Lavrov has met the head of the Syrian opposition’s High Negotiations Committee, Nasr al-Hariri. The Caliphate, the goal of ISIS, has failed to materialize, but the task of crushing separate hotbeds of terrorism still remains. We expect that an advance of the intra-Syrian dialogue will help to join efforts of all Syrians to ultimately root out the terrorist threat in that country. Russian State outlet TASS did not report any comment from Hariri. Trying to hold the political initiative, Russia first declared the Sochi congress last autumn; however, it has been postponed repeatedly. One obstacle is Turkey’s objection to the involvement of certain Syrian Kurdish groups, including the Kurdistan Democratic Union Party (PYD), a barrier raised further by the Turkish-offensive offensive on Kurdish territory that began last Friday. Another is the Syrian opposition’s objections to any process that maintains Bashar al-Assad in power. The Douma Medical Center reported 21 victims with respiratory symptoms after the claimed chemical attack, the second in ten days on the town. Despite a purported de-escalation zone, pro-Assad forces have tried for months to overrun opposition territory in the East Ghouta area and have tightened a five-year siege, threatening almost 400,000 residents. Speaking in Paris on Tuesday, US Secretary of State Rex Tillerson condemned the use of chemical weapons and said that, by “shielding its ally”, Russia has “betrayed the Chemical Weapons Convention” and UN resolutions. Tillerson maintained that the Russian position called into question its relevance to the overall situation in Syria. Syrian State news agency SANA says nine civilians were killed and 21 injured, some critically, on Monday by shelling of the Bab Touma neighborhood in Damascus. Police officials blamed “armed groups” in East Ghouta. NextBBC Radio: Republicans Claim Shutdown Victory But Have They Lost the War?